I received a Skribit suggestion that I talk about cadets bringing laptops on cruise. Not only can cadets bring their laptops, but I would highly encourage it. In the evenings on cruise we have plenty of down time, and having a laptop provides plenty of entertainment opportunities. Almost everyone brings DVDs as well as movies stored on their computers directly, so having a computer on board allows you to watch all the movies available (Note: Chartwells also rents movies to cadets very cheaply and they have a large selection). One of the biggest issues on cruise last year was communications. While we’re at sea, we have very limited contact with the rest of the world. We have an e-mail system that connects a few times a day to send and receive e-mails held in the queue, called SeaWave. And that’s it. No Internet, no phone. Just a delayed e-mail system. It may sound like a problem, but in reality it’s all we really need. I took this picture this morning from my room, which is why the picture quality leaves a little to be desired. However, I wanted to seize the opportunity to get the shot, since they’re keeping the new name covered up until the ship is christened as the USTS Kennedy. So, enjoy this “sneak preview” picture of Massachusetts Maritime Academy’s training ship with its new nametag. If you’re a little confused as to why there’s a new name on the bow, take a look at this post. 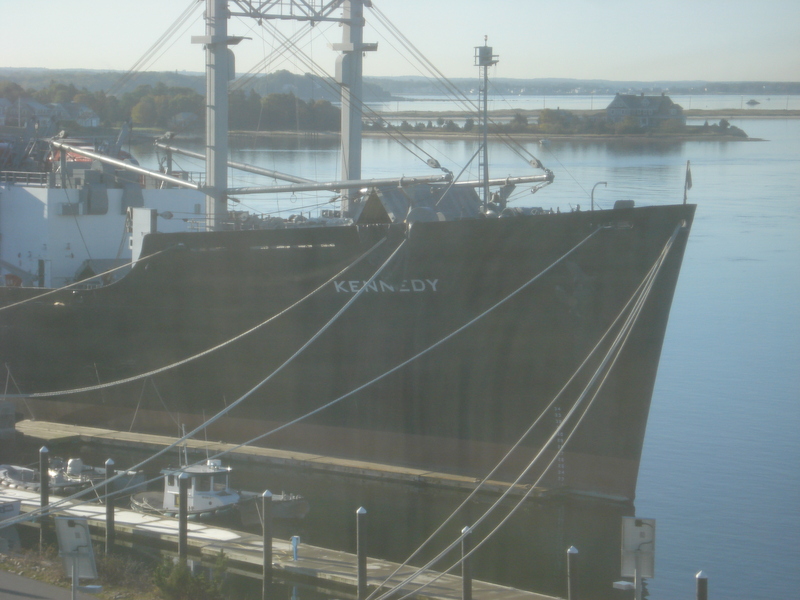 As I’m sure most people are now aware, the Academy trustees have voted to rename the training ship to the USTS Kennedy, in honor of Ted Kennedy’s service as a U.S. Senator for Massachusetts. I was asked last week via Skribit that I write about cadet reactions to the name change. There hasn’t been much discussion among cadets about the name change, to be honest. We heard a little bit about it at the beginning of the year, and were asked to express our opinions via e-mail about a possible name change.